Three Cardiff Try’s in the opening 20 minutes laid the foundations for a Cardiff bonus point win against Brynley Toms and his Bedwas Rugby teammates who battled hard ‘til the end and were unlucky not to score a fourth and bonus point winning Try. 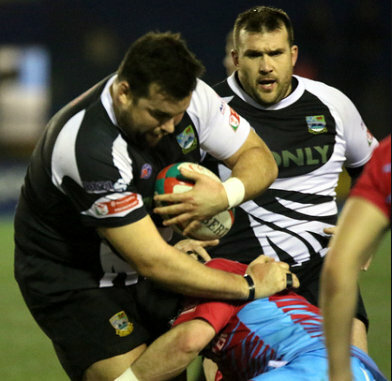 Cardiff would defeat Bedwas 35 - 17. The game opened with both sides defending well and some kicking the ball deep to allow full backs time to clear. It was the home side who opened the scoring on 7 minutes with full back Tom Williams given time and space to drift through the Bedwas defense. Outside half Gareth Thompson duly converted. Eight minutes later from a line out deep in the Bedwas half Morgan Allen doubled the home side’s advantage with a strong carry to the try line, Thompson again converted. Bedwas tried to get back into the game but midway through the half another line out deep in Bedwas territory saw the ball moved quickly to inside center Ben Thomas to run in, throw a dummy and cross under the sticks. Thompson once more adding the extras. Bedwas responded almost immediately and following a break from Adam Williams the ball was moved down the right with inter passing from Luke Crane and Connor Edwards to see the latter cross for a try out wide. Joseph Scrivens’ conversion was successful despite the narrow angle. Five minutes later a series of drives by the Bedwas pack earned Bedwas a second try as James Richards was driven over under a pile of bodies for a try; Scrivens’ conversion attempt drifted across the posts. Further Bedwas attempts were denied by a determined Cardiff defense. Cardiff scored their fourth and bonus point winning try on 50 minutes as center Will Rees-Hole got over for a try again converted by Thompson. Bedwas countered with sustained pressure but the Cardiff defense held out until the 70th minute when Ben Thomas got on the end of a neat grubber kick to win the race to the ball. Replacement Steffan Jones added the extras. With fresh legs on the field Bedwas mounted a series of attacks which eventually brought the reward of a try as replacement scrum half ducked under would be tacklers to cross for a try. With three minutes of stoppage time remaining Joseph Scrivens hurriedly took the conversion (and missed) in the hope that Bedwas might still salvage something from the game. Bedwas continued to attack deep in the Cardiff half as they sought the fourth try and despite great endeavor they were unable to breach the home defense and thus no reward for their efforts.